Mobile Suit Gundam Unicornâ€™s Doven Wolf-inspired Silver Bullet joins the HGUC lineup! Appearing in Mobile Suit Gundam Unicorn Bande Dessinee, the Silver Bullet is adapted from the powerful Doven Wolf. 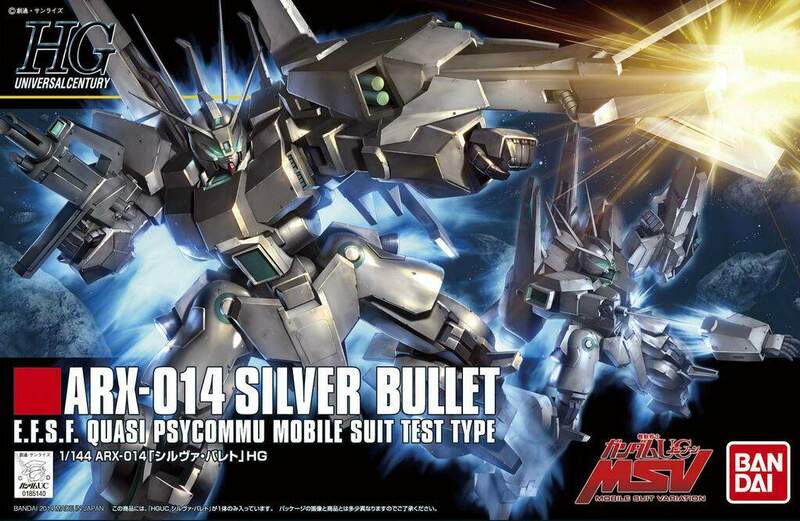 A more powerful Suit than its predecessor, the Silver Bullet features a variety of gimmicks to add to the build experience of this kit. Faceplate can be changed out to feature either the GM-style or Gundam-style head! Large missile can be mounted on the Suit. Missile launcher hatch can be closed or opened. Suit equipped with INCOM storage gimmick. INCOM Wire effects and Stand included for dynamic action poses!